A combination of calcium and vitamin D3 in a unique capsule format. One capsule provides 400mg of calcium in three active forms; as calcium hydroxide from Lithothamnion sp, as calcium citrate and as calcium ascorbate alongside 200mcg vegan vitamin D3 from lichen. Calcium and Vitamin D are needed for the maintenance of normal teeth and bones. Calcium also contributes to normal neurotransmission and muscle function. Calcium (as hydroxide from Lithothamnion sp, citrate, ascorbate), Vitamin D3 (vegan cholecalciferol), Vegan capsule. As a food supplement take one to three capsules daily with food or as directed by your healthcare practitioner. 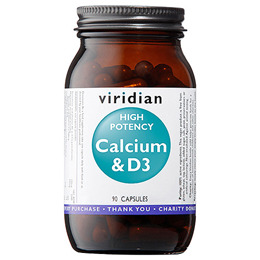 Below are reviews of Viridian High Potency Calcium & Vitamin D3 - 90 Capsules by bodykind customers. If you have tried this product we'd love to hear what you think so please leave a review. A combination of calcium and vitamin D3 in a unique capsule format. One capsule provides 400mg of calcium in three active forms; as calcium hydroxide from Lithothamnion sp, as calcium citrate and as calcium ascorbate – alongside 200mcg vegan vitamin D3 from lichen.